This expanded Village Antique is loaded with updates, great spaces with a mix of antique detail and well integrated modern convenience. Renovated kitchen and baths, fully remodeled second level with three great bedrooms. The layout also includes a large fireplaced family room, formal living and dining, plus a first floor den. Close to the center and Dean Park and Library. 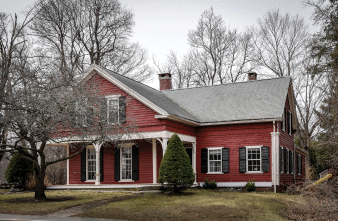 Choose your exterior paint color scheme and make this antique sparkle.